I stopped into the Alien Fresh Jerky store a couple months ago and found they added some more exotic meat jerky, namely this Space Gator and an Orbit Ostrich. Both of which are manufactured by TM Jerky & Processing out of Monrovia, CA. I'll be reviewing the ostrich later. I'm not certain that Alien Fresh Jerky is still marketing this alligator and ostrich jerky because I don't see it listed on their website. It may be something you can only buy from their brick-n-mortar store in Baker, CA. But if you find yourself travelling north up the I-15 from Southern California, you'll want to stop there anyways, it's worth the visit. Alligator, brown sugar, soy sauce, water, salt, spices. The first thing I taste from the surface of these pieces is a sweet flavor, followed by a gamey/fishy natural meat flavor, and finally a light saltiness. The chewing flavor starts with an increased saltiness, a touch of soy sauce, and more of that gamey meat flavor. Considering it's an alligator jerky, there does seem to be a fair amount of natural meat flavors. Since I'm not an expert on judging alligator meat, I can't really tell if you this tastes like alligator, but it does have a meaty flavor. And I used the word "gamey" because it seems to have that characteristic you often find in venison, elk, and other exotic meats, but it's a little more "fishy" flavored. It's also very sweet. In fact there seems to be as much sweetness as there are natural alligator meat flavors. There's enough sugary coating on this jerky that it's slightly sticky, and the vacuum packaging causes these strips to stick together into one huge gator blob. After the natural meat flavors, and the sweetness, there's a well-noticed saltiness, which I'd rank as "medium-high". There's also a faint soy sauce flavor that I can pick up here and there. I want to say I can sense traces of garlic. Overall, it's seem to be a heavily sweetened alligator jerky, with a gamey/fishy meat flavor, and a good deal of saltiness. These are slices of whole meat, sliced into strips ranging from 3 to 6 inches in length, and sliced thick. 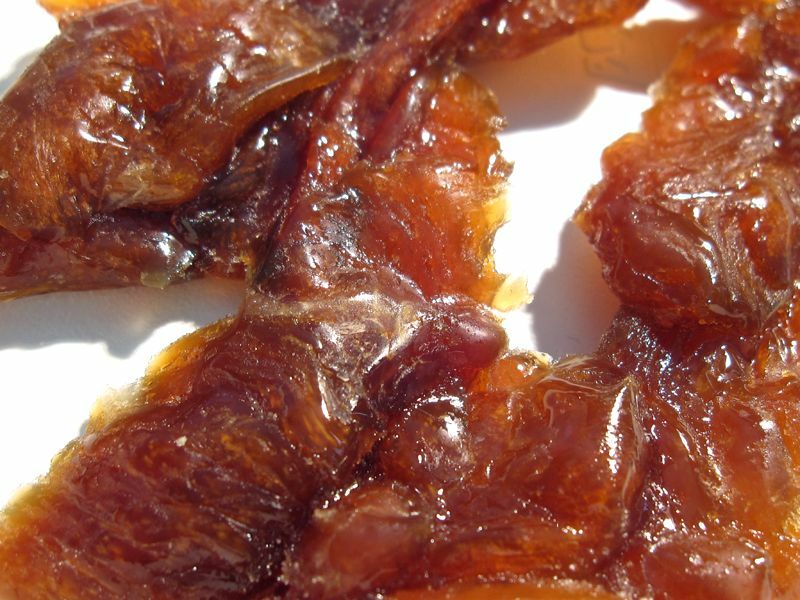 This is a semi-moist jerky with a sticky surface feel. There's a good deal of flexibility in these strips mainly due to the thick sugary glaze. Biting chunks off these strips seems easy enough, and chewing seems easy. The chewing texture starts out feeling soft, but rubbery. They chew down to a soft mass quickly and easily enough, and by that time, they have a mushy quality. There are some drier pieces that seem to have a more meaty chew. But overall, the chewing is mushy. The strips appear to be quite lean in that I don't see much fat. The chewing seems to reveal the same, finding nothing unchewable or crunchy, but a light amount of stringiness. In terms of clean eating, handling these strips results in some stickiness on my fingertips, but not enough to require a licking and wiping. 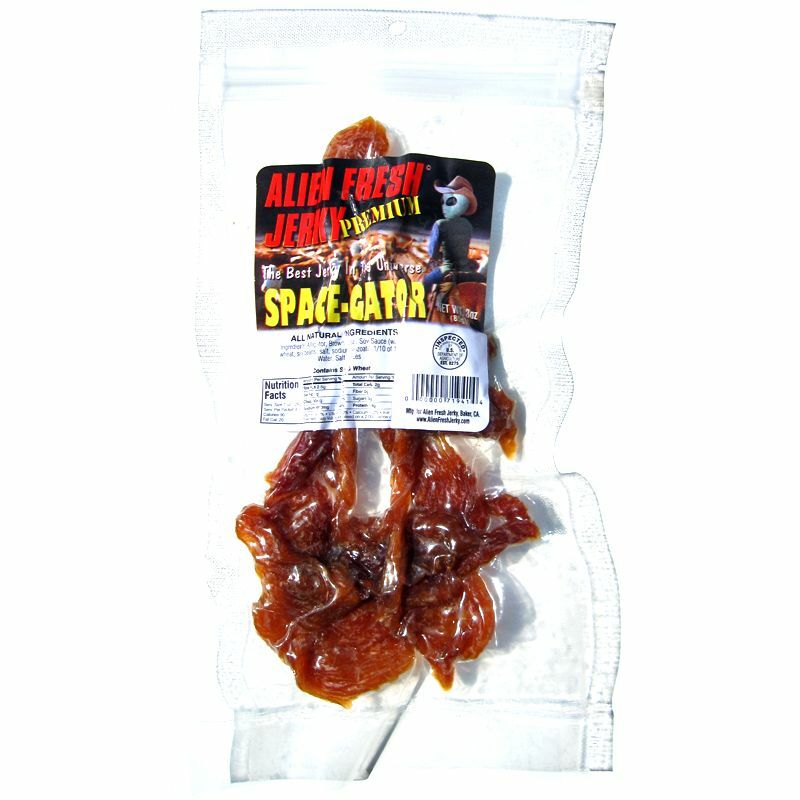 Alien Fresh Jerky sells this Space Gator in 3oz packages at a price of $20.00 for three. That works out to a price of $2.22 per ounce. For general jerky snacking purposes, at the $2.22 per ounce price, it's a poor value. I'm not getting any snackability from this. The overall flavor is not that great, and the meat consistency is not impressive. That price is higher than what you'd pay for major jerky brands in grocery stores, and yet it's not very enjoyable. But as an alligator jerky, at the same $2.22 price per ounce, it's a fair value. That's actually a cheap price for alligator jerky when you consider other alligator jerky brands I've reviewed are in the $4 and $5 per ounce ranges. But the flavor is rather gamey or fishy, and it chews mushy. I'm giving this a dog treats rating. 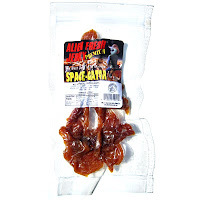 This Space Gator jerky from Alien Fresh Jerky has a strange meat flavor that I can only describe as "gamey", or more accurately as "fishy". I recall the alligator jerky from Mountain America Jerky also has some fishiness to it, but not quite as much as this one from Alien Fresh. When I eat this, that flavor seems too well noticeable. It's also very sugary sweet, and I just don't think that works very well with alligator. This is a meat that seems better off smoked and seasoned, not sugared up and soaked in soy sauce. The heavy sweetness is what seems to make this chew mushy. At first I had considered giving this a two-star rating, but I found myself not being able to tolerate that stronger gamey/fishy meat flavor. I come from the south and Alligator cooked properly has a barely noticeable fish taste, but more of a mix between beef and pork. This jerky company should probably be due for another visit from the health department. According to your description of the flavor of the meat, the alligator was not handled properly. I've had home-made alligator jerky and as it stands along with buffalo jerky, as my most favored jerky.